Our east coast move has been a bit of a whirlwind and my head still hasn’t entirely stopped spinning. There has been quite a bit of “new” in our lives in the past three months, and that including plenty of new running locations and opportunities for me! I held off on setting my fall race schedule until we moved out here and am just now getting things squared away. This meant that I haven’t had anything coming up, which has been a bit of a struggle. I always feel better when I am focusing my training on a particular race, and I’ve been itching to get back to race almost from the moment I arrived in Delaware. 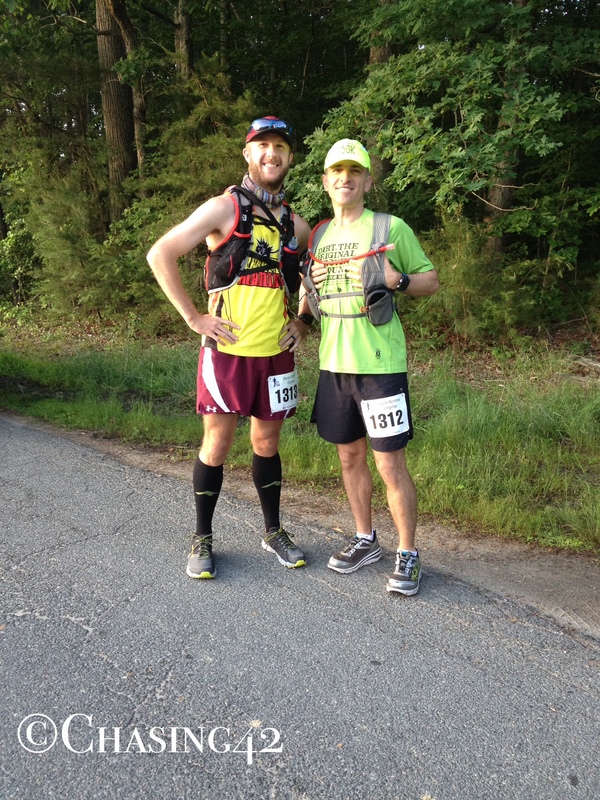 So, last week, on a bit of a whim, I signed up for a 50K trail race in Maryland. The MD H.E.A.T. 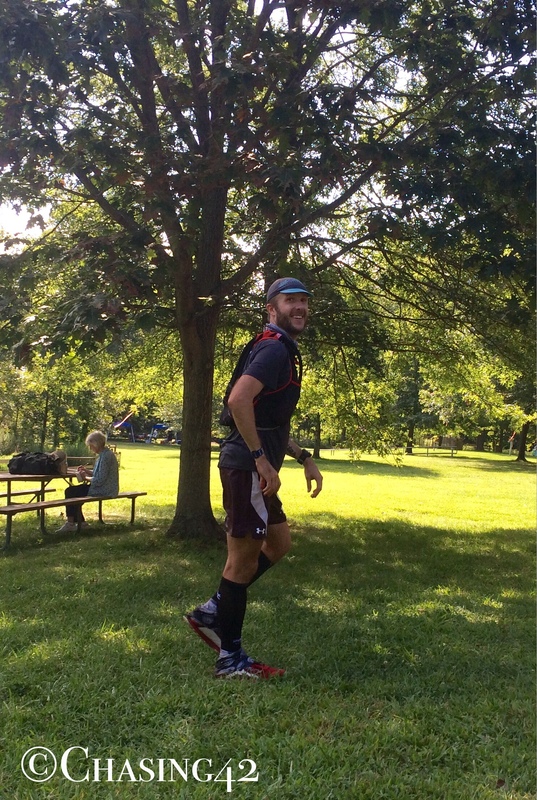 (High Endurance Adventure Test) race was held on August 8th at Patapsco State Park, just outside Baltimore. This meant it was easily within driving range, and I could head down the morning of the race and avoid any need for sleeping accommodations. The epicurean, along with Looper, decided to join me and we made an adventure of it. The result was an immensely challenging and satisfying day! There’s really only one reason I will ever set my alarm for 3:30AM, and that’s for a race day wake-up. Google told us it would be a 75 minute drive, and the race started at 7AM, so we wanted to be on the road by 5:30 to ensure we had a decent buffer for any directional miscues. I made sure to organize my clothes, shoes, and pack the night before to make the morning as easy as possible, but the alarm was still a painful siren call that I found myself compelled to answer. 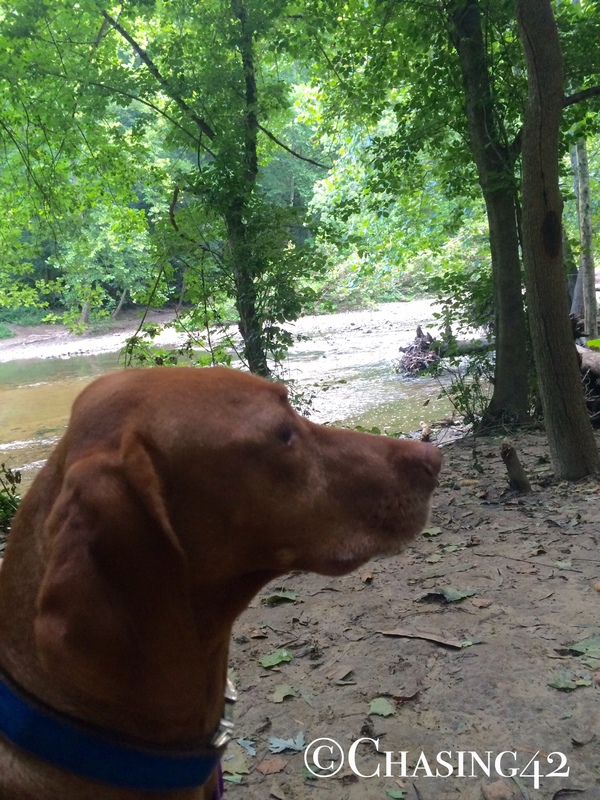 Looper, our Vizsla, loves the outdoors so we brought her along for the ride. Luckily, she is a wonderful traveler and relatively comfortable in new environments. The race bused folks into the park from a nearby park-and-ride due to the limited amount of parking available on site. We had received permission to drive directly to the park because we had Looper with us, but ended up driving to the park-and-ride first. I arrived at packet pickup around 6:50, which gave me just enough time to pin my bib on, take care of business, and rush to the starting line. This event was technically more of a “run” than a “race”, as they weren’t giving out awards or keeping track of age groups. 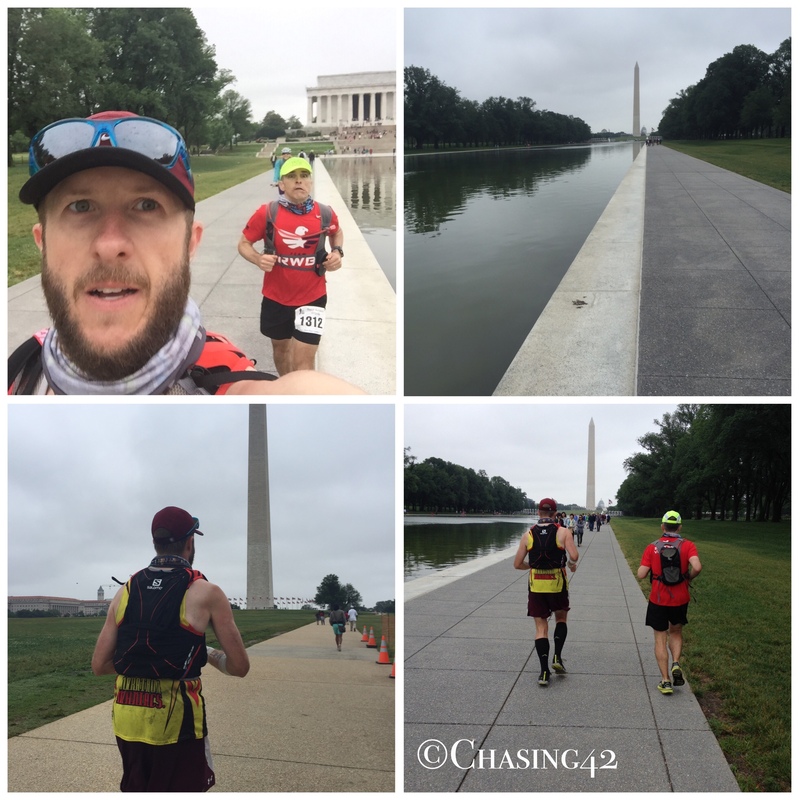 They offered a 25K and a 50K, with both groups traversing the same 16-mile loop. 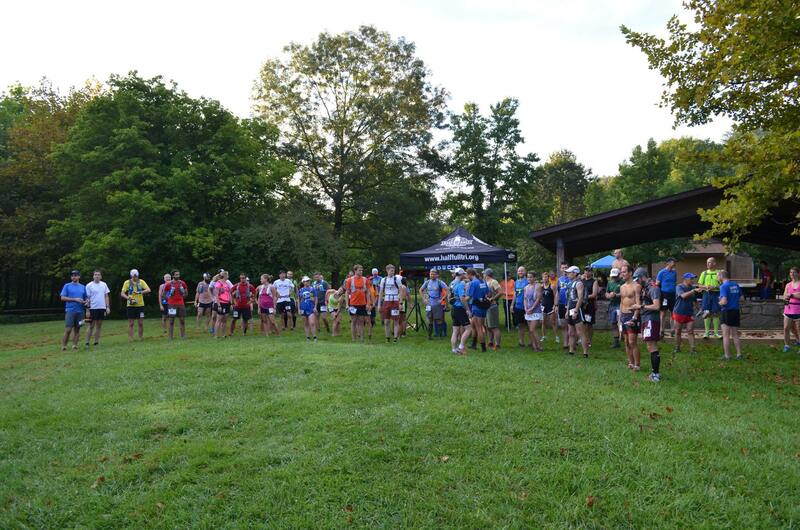 The 25K didn’t begin until 9AM, so the considerably smaller group of 50K runners (approximately 50) had a solid two hours on the trail before the additional 300 folks started their own trek. Waiting at the start for the go. Since the 25K was the main race, the aid stations weren’t going to be fully staffed and set up until the 9AM start. Thus, we had to have enough hydration and nutrition for the first 8 miles with no aid stations to resupply. 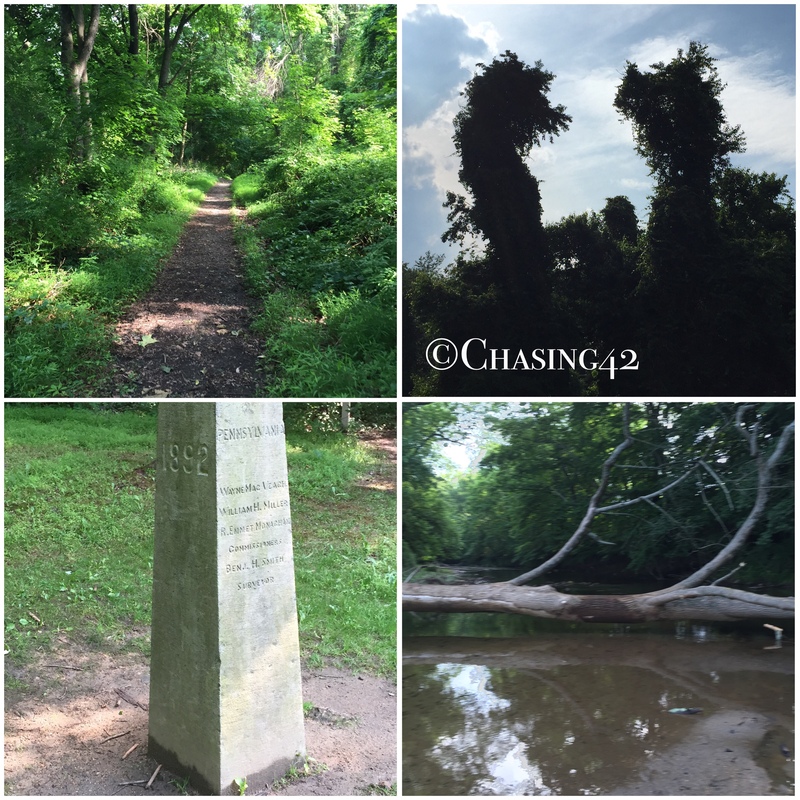 The park itself runs along 32 miles of the Patapsco River, and encompasses over 16,000 acres. the route took us along beautiful single track, with the occasional access road and paved trail used to connect various points along the way. I mentioned in an earlier post that my legs are still becoming accustomed to the hilly terrain surrounding me, and this race served as my first real test. Welcome to the east coast hills! The first 8 miles of the loop were without a doubt the most difficult, and I became aware very quickly of the elevation gain this race had in store for me. After a fairly calm first mile, several decent hills greeted me over the next few miles as we made our way up and down the river valley, crisscrossing a hilly power line clearing, and navigating switchbacks. We crossed several streams, and the quick splash felt wonderful on a morning where the temps were already in the 70’s and the humidity was approaching 90%. “HEAT” was certainly an appropriate name for the race! It was clear pretty early on that this flatlander wasn’t in Iowa anymore, and my quads were yelling at me for the deception. However, the copious elevation gain I’d been logging over the past few months seemed to have paid off, as I was navigating the highly technical trail pretty well and embracing the climbs. After several sizable climbs, I thought I was well acquainted with the trail and ready to tackle anything that came my way. Then I reached the Grist Mill Trail turn. Around 5.8 miles in, the course took a sharp 90 degree right turn and I ran smack into a rock face. It took me a moment to look up and see the course markers to realize that we were supposed to go up! The 47% grade meant climbing with my hands as much as my feet, and grabbing onto tree roots to pull myself forward. After 100 feet or so, the trail leveled out just enough to stand up again, and I looked up in search of a summit that wasn’t there. The trail seemed to disappear into the woods, and the dense tree canopy nicely shaded the way. This would prove to be the toughest climb of the race, and one of the tougher climbs I’ve tackled in any race, although I’m sure I have more of them ahead of me! At one point, the trail opened up just enough to the left for a scenic outlook and a beautiful view of the valley below. If I had enough oxygen in my brain, I would have snapped a picture but I had to settle for a few of the hill itself. After finally reaching the summit, the trail leveled out and slowly began a calm descent over the course of the next mile, before we eventually ran into a paved bike trail along the river. We took the bike trail for about a mile, and my feet yearned for the rocky, rooty single-track instead of the smooth asphalt that was guiding me along. We crossed the river on a swinging bridge, and the mile 8 aid station was waiting for us when we got to the other side. I could not have been more happy to see those volunteers! The roads just don’t compare! This was the first race I had run that offered Tailwind at the aid stations, which was a wonderful surprise and convenient supplement to my own supply. I lingered for a few minutes before thanking everyone and heading back out on the course. 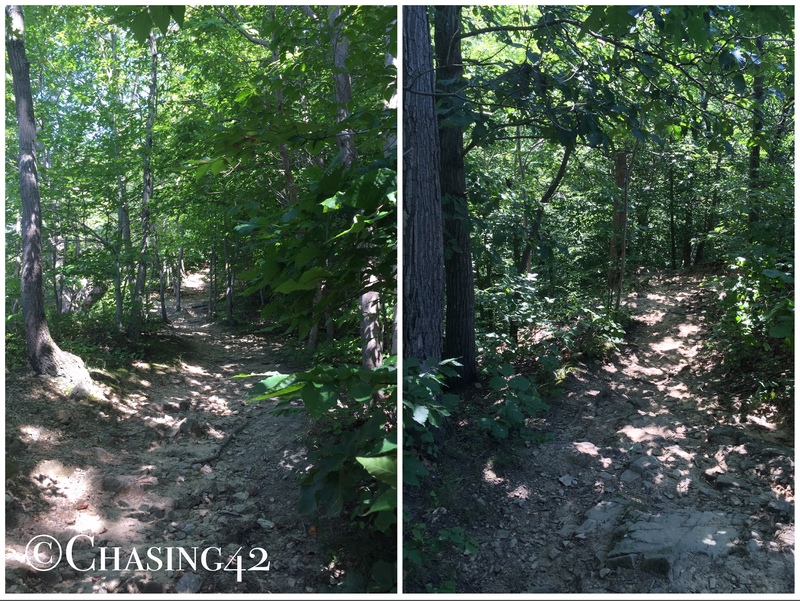 Almost immediately, the trail made its way up another steep incline but I was feeling much more refreshed after my pit stop and I tackled this hill which considerable ease. After reaching the top, the next 6 miles were relatively easy compared to the first half of the race. The trail continued to offer plenty of rolling hills, stream crossings, and technical switchbacks, but my legs had adapted and I tackled the miles quite comfortably. With less than a mile left, the trail ran straight into a 30 foot stone wall. I initially looked straight up and sighed at the thought of having to scale the enormous wall, which was serving as some sort of barrier along the river. However, I eventually noticed the 8 foot connecting wall situated at a 90 degree angle, and headed over to scale it. Going up was fairly easy, but going back down the other side was a bit more treacherous and I wondered what it would feel like on the second loop. I landed safely on the ground, picked the trail back up, and headed for the clearing and the start/finish area. I finished the first loop a bit faster than I had intended (shocking, I know!) but I was feeling really good. I stopped to chat with the epicurean, rehydrate, and take in some more nutrition, and then I headed back out on the second and final loop. Heading back out for loop 2! I knew what awaited me as I ventured out on the second loop, and was encouraged by the fact that I would encounter aid stations every 4 miles for this second loop. My legs were doing an excellent job of reminding me of the first loop as I tackled the early hills on the second loop. My pace slowed some, but I expected that and welcomed it, knowing I had more than enough time in the bank. I was partially dreading and partially looking forward to the Grist Mill climb as I moved along, so everything up until that point seemed more like an opening act before the main attraction. My legs were much more tired the second time around, and I’m sure the climb took me longer, but I relished in the accomplishment, one foot in front of the other. 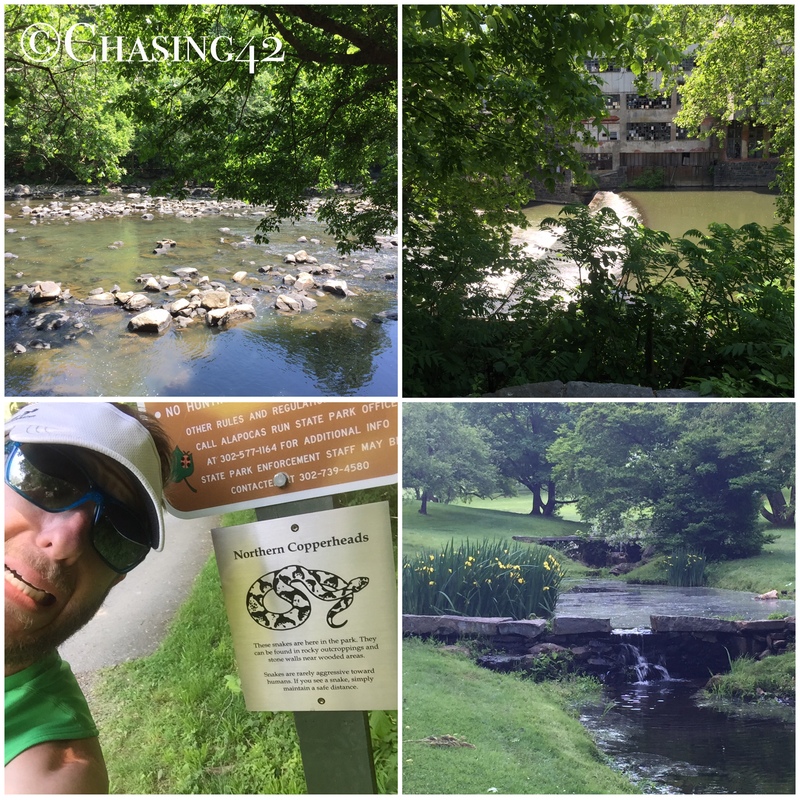 By the time I reached the paved bike path, the popular state park was much busier, and I found myself avoiding walkers, runners, bikers, and other folks wandering down by the river. I was that much more excited when I reached the swinging bridge because I knew I only had 8 miles left and they were quite manageable. 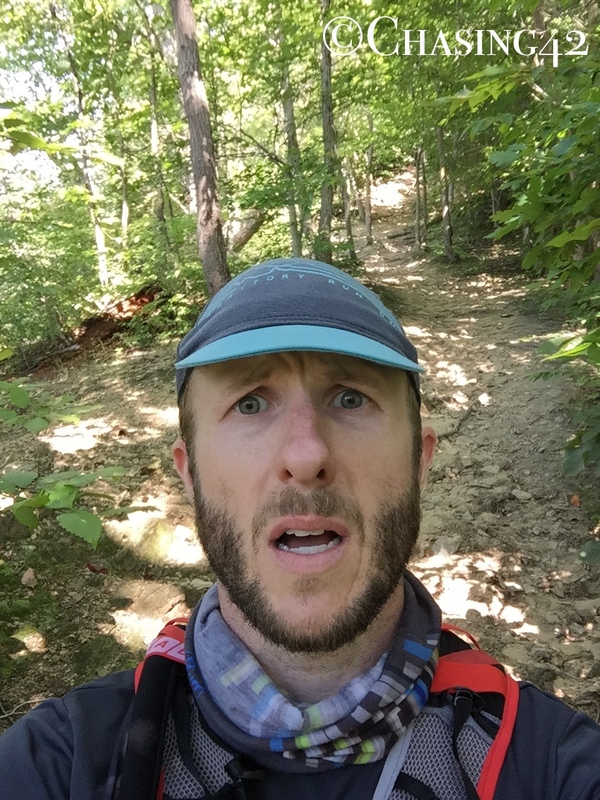 A minute or so after I arrived at the mile 8 aid station, another guy came in and promptly called it quits. I tried to talk him out of his DNF and offered to run with him for a bit but he was done. I made sure to maintain my positive attitude as I embarked on the large climb just past the aid station. Looper enjoyed the river almost as much as I did! The final 8 miles flew by pretty quickly, even if I wasn’t moving as fast as the first time around. I had judged my hydration and nutrition well, and my body was feeling good even if my legs were a tad bit tired. 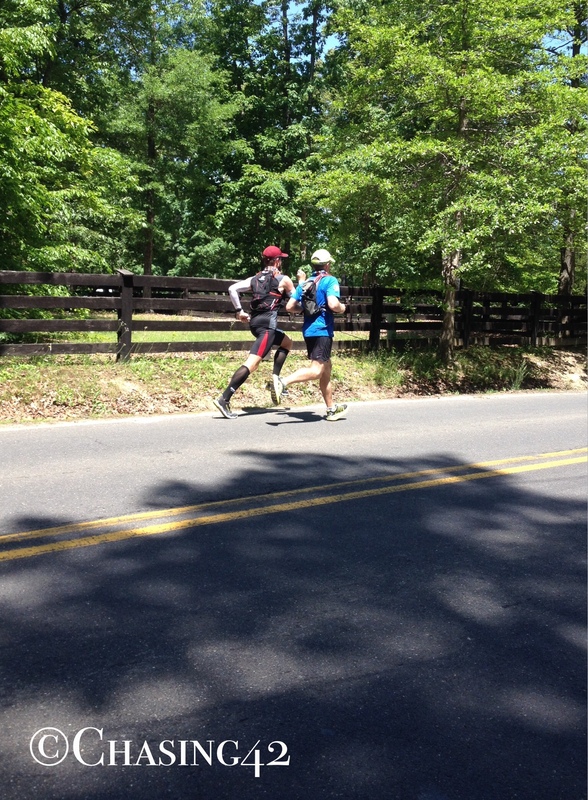 Over the next few miles, I began to pass folks running the 25K race, and I did my best to encourage them to keep going. I stopped a few times to offer assistance to folks, but kept myself moving forward. Relentless forward progress was key! The wall climb at the end proved to be much easier than I thought it would be, but I was a bit disoriented when I got to the other side until someone pointed out the exit onto the clearing to me. I emerged from the beautiful, shaded park and ran through the finish line to the sound of ringing cowbells (have I mentioned how much I despise them? ), and I had a delightfully exhausted smile on my face. I collected some food at the finish area and headed over to sit down and decompress with the epicurean and Looper. In total, I gained over 5800 feet of elevation, which, considering the distance, made this the hilliest race I’ve run to date. When you throw in the highly technical trails, it became a fantastic test not only of my trail running abilities, but of my hill work as well. My quads were sore, but I was feeling great. It may have been a wicked early morning, but this impromptu race turned into a wonderful mini-getaway. It will no doubt be the first of many in our new east coast home! Not a bad view on the way home either! It’s hard to believe that we’ve been in Wilmington for two months now! The summer has truly flown by, and now that I’m caught up on my final Iowa escapades and the amazing experience that was the Race Across the USA, I can return to my regularly scheduled programming. It’s been a simultaneously relaxed and eventful transition, complete with all of the chaos of setting up a new home and figuring out the world around us. We’ve slowly begun to carve out a home for ourselves, figure out how to meet our regular needs, and begin to navigate a completely new part of the country and new stage in our lives. The epicurean’s new position at the Winterthur Museum, Library, and Gardens has been a wonderful transition and I can honestly say that I’ve never seen her more happy day in and day out. I completed my summer teaching responsibilities online at Iowa State, and have now officially left that position and am on the hunt for a new professional adventure (if you have any leads, I’d be happy to forward my resume 🙂 ). Amidst the unsettled nature of hitting reset on the life button, I’ve found time to continue my training in a way and have learned quite a bit about my new running home along the way. There are many new trails, hikes, races, and running friends to look forward to, and I’m certainly excited for the new running opportunities that living on the East Coast presents. It’s been a profoundly different and challenging experience to run so many miles without my Vardo partners in crime, and I still miss them terribly. When I first undertook the challenge of running, it was the friends surrounding me that kept me going, got me out the door, and motivated me on a daily basis. Throughout my growth as a runner, my biggest joy has been the relationships I’ve built and the opportunities to witness others accomplish their own running goals and grow closer to them with each passing mile. It’s strange, then, to find myself in a new area of the country where I know no one and am now running more solo miles than I’ve ever run before. I often find myself, out of habit, thinking about who I would share any new discovery, route, or trail with and then realizing that Facebook is truly only a shadow of life, always shifting as the earth turns each day and the sun rises and sets. Nonetheless, I’ve managed to discover some pretty exciting locations and opportunities in my short time in Delaware and I’m optimistic about what the future will bring. So, let me give you the Cliff’s notes version of what still feels like an extended vacation! Technically speaking, we aren’t that much further south so I didn’t expect the summer weather to be all that much different. I should have known better. It was in the 90’s the day I drove up in May, and it has been consistently hot all summer with little sign of relief until fall. I’ve never been a huge fan of the heat, and it’s always taken me what seems like far too long to acclimate, but it’s been an entirely new challenge in Wilmington. In addition to the heat, the humidity is rather atrocious. I’m used to a few days of high humidity every once in a while, but I seem to be bathing in a dog’s mouth every time I step foot outside. It doesn’t matter if I’m beginning a Saturday morning run at 6AM, or heading out for a short afternoon run. My body has been struggling to cope, and it’s definitely left me more exhausted than normal. I realized just how bad the humidity was a few days ago when it dropped to around 40%. Despite temps that hovered around 90 degrees, my run felt almost effortless by comparison. It really does make quite the difference! It’s no secret that Iowa is a pretty darn flat state. I’ve spent my entire running life in Iowa, which meant I was far from accustomed to any sort of variable terrain. It wasn’t uncommon for me to log 25 or 30 miles and see a grand total of 300 feet of elevation gain. Delaware, however, is a different story all together! My legs are now, after two months, beginning to adjust to the fact that every single run I go on here is the equivalent of a hill workout in Iowa. I’m not sure there is a single stretch of flat land anywhere to be seen, and I’ve been racking up the elevation gain! The result is a new-found confidence with a wider variety of races, and the realization that I might be able to tackle some of my mountain-running bucket list items after all. Since my first ultra and first trail race several years ago, I’ve been hooked. There is just something incredible about hitting the trails for a run and losing yourself in the miles that I can’t seem to replicate on the road. Unfortunately, living where we did in Iowa meant very limited access to trails and spending most of my time on the road. The landscape around Wilmington is a totally different experience! 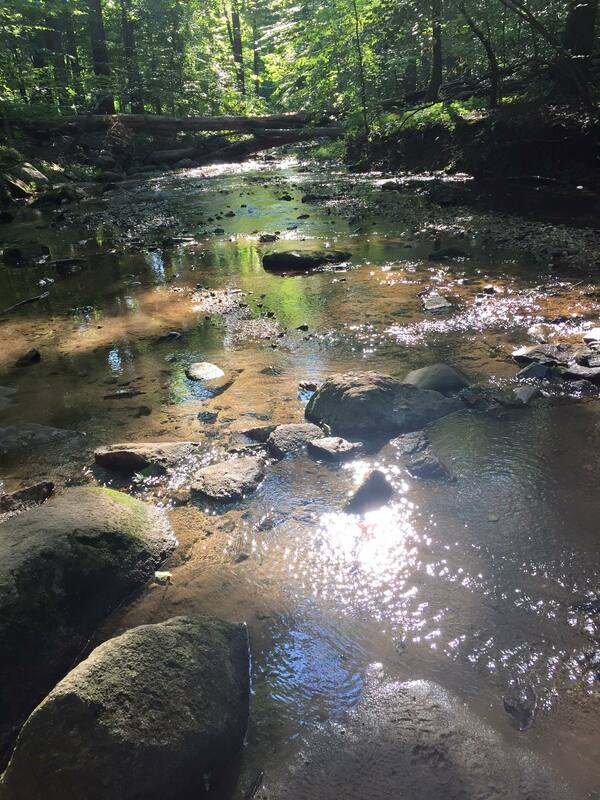 There is a wonderfully high concentration of state parks within running distance of our house, and even more access simply by hopping in the car for a few minutes. We bought a state park pass, naturally, and I’ve already had the opportunity to hit the trails in 5 different parks. It is a strange feeling to have such incredible access to so many legit trails, complete with switchbacks, stream crossings, and relentless hills. I’ve been in trail heaven! I’ve made it crystal clear how important it is to me to be surrounded by like-minded individuals who share my passion for running. So much of my motivation comes from the efforts of those around me, so it was quite hard to leave such a tight-knit community behind. Luckily, I’ve begun to connect with other runners in the area, with the hopes of cutting back on my far too regular solo runs! I took it as a great sign that our next door neighbor is also a runner, and I even had the chance to run with her and a friend the first Saturday I was here. 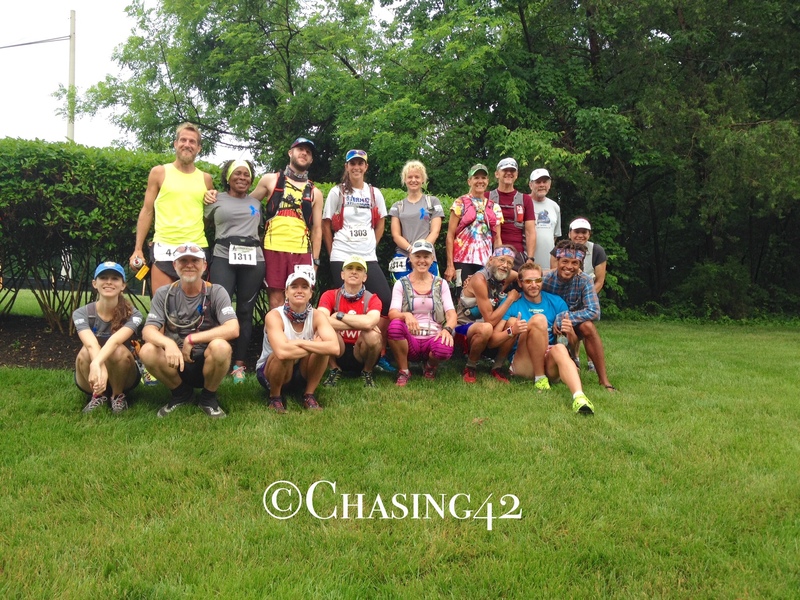 Since then, I’ve found the Delaware Running Club, and have run with them on numerous group trail runs. I even had the chance to participate in the Festival of Miles, which was my first official track race and led to my new mile PR of 6:08. Obviously I need to get it under 6:00 now! It’s a large group full of wonderful people with diverse running and life backgrounds, and I’m really enjoying getting to know folks! One of my favorite places to run thus far is actually a place I find myself every single day (and jealous of the fact that the epicurean takes her lunch breaks on the grounds!). I wrote about Winterthur back in December when we traveled out so the epicurean to visit, and I was mesmerized then. However, the gardens truly shine in the spring and summer, with something new in bloom practically every week. There are countless paved and single-track trails meandering around the 1000 acre estate, and I truly feel as though I’m in another world, whether I’m out there running or curling up with a good book as I listen to the birds sing. I’ll be sure to highlight the beauty of this place in a future post, but few words can truly do it justice, especially for this Midwestern flatlander! So there you have it…it’s been a hilly two months, if you will, in more ways than one but we are finally beginning to settle in and get to work on making Wilmington our home for many years to come! It’s all been building up to this final day, so hold onto your seats and prepare for a bumpy landing! The first three days of our time with the Race Across the USA were hot, humid, and tiring, but we were feeling good and enjoying life. We’d logged even more miles than we had planned, and our legs had seemingly adapted to the daily mileage because we were recovering without too much strain. We headed home from dinner with the core team members and other runners after celebrating the end of the journey the following day, and we settled in for a good nights sleep before our final day’s trek. We woke up a bit earlier the next more and got ready, unsure of the traffic situation now that we were so close to D.C., and wanting to make sure we arrived at the starting point in plenty of time. Luckily, the morning went smoothly, and we arrived around 6:20AM, which gave us time to get a bit more shut-eye and take care of other business, if you will. After the heat of the last three days, the cooler temps, wind, and light rain were a welcome relief. It was clear that everyone was quite tired as 7:00AM came around, but the excitement of finishing more than made up for it. On top of that, I was looking forward to running on a long stretch of paved trails after 3 days of winding country roads and minimal shoulders. Ready for the last day! After a mile or so on the trail, we were moving along nicely and I was feeling great. Then it happened. I had managed to stay vertical for three days and countless uneven roads, but the asphalt trail jumped up and bit me. I went down hard at full speed and rolled/slid to a stop several feet further along on the trail. Stefan and one of the other runners that had joined us stopped to help me up and make sure I was ok. I was more stunned than anything as I took stock of the damage. In true runner fashion, first I checked my gear and then i checked myself. I had collected a huge gouge in my knee, a nice hole in the palm of my hand, and some quality scrapes on my shoulder. I pulled out a wet wipe and wiped away as much dirt as I could, and tried to stop the significant bleeding a bit. Nothing hurt all that much, but that no doubt had more to do with the adrenaline pumping through my body than anything else. The first aid station was only a mile or so away and I knew they had a more substantial first aid kit, so I picked myself up and we kept moving forward. Bandaged up and ready to go! We showed up to the aid station, and they knew I had gone down, so they were ready. I stopped for a few minutes to clean my wounds a bit more and bandage myself up (I guess that EMT training is still paying off, eh? ), and I was back out on the trail in less than 5 minutes. All I could really do was laugh at the ridiculousness of the situation and recognize that it was going to make for a great story. Stefan and I continued to tick off the miles on the beautiful wooded trail, and we found ourselves having to intentionally slow down because we were moving faster than we figured we should be with another 18 miles to go. 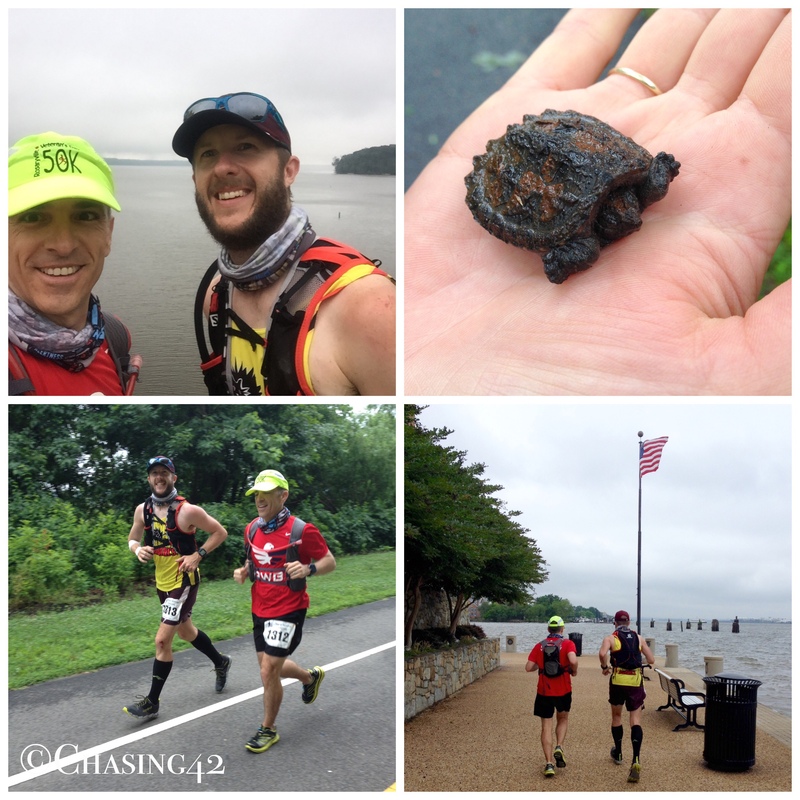 Nonetheless, the cool weather, mist, and excitement of the last day meant we were moving along at a good clip, and the miles were rolling by as we made our way closer and closer to the National Mall. We stopped briefly at several different points to take pictures and simply enjoy being out there, and marvel at how lucky we were to be able to do something like this in the first place. After Jamile had dropped us off, she went and parked the truck downtown and road her bike backwards to meet us on the trail. She caught up to us around mile 16 and I showed off my impressive wounds when she rode up to meet us. I was still feeling a good amount of pain because I hadn’t been able to apply any Neosporin but running served as the perfect distraction and I seemed fine as long as I kept moving. Running along the Mt. Vernon Trail. It was wonderfully refreshing to have the Potomac River to our right, guiding us towards the White House. Once we reached Reagan international Airport, D.C. began to come into view, and it became harder and harder not to stare off into the distance, but my desire to be distracted was balanced out by the reminder of the bloody holes in my knee and hand 🙂 You can bet I was keeping an eye on my footing! We finally reached the Arlington Memorial Bridge, and crossed over, heading towards the Lincoln Memorial. We stopped for a few quick photos, and then continued down the National Mall towards the National WWII Memorial, and then the Washington Monument. The rain and cooler temps had kept many of the tourists away, so the mall wasn’t nearly as crowded as we had expected, which was wonderful. We passed the Smithsonian Castle and headed for the Capital, and then hung a left to head up Pennsylvania Avenue for the final approach. I suppose it was this final stretch when it finally began to sink in that we were going to do this, and we both got even more excited. The final stretch of Pennsylvania Avenue flew by as we neared completion amidst so much history. It was very fitting that we would end our journey, and all of the core runners would end a so much more amazing journey, in front of the White House. We made the turn for Lafayette Square and could see the group off in the distance. We picked up our pace a bit and were all smiles as we crossed the final finish line. We had done it- 4 days, 120 miles, some spilled blood, and more memories than I could count. A few of the other runners had already finished, and we all congratulated each other, and then we sat down. It felt rather good to sit down (even if it did mean I could feel my injuries in a much more pronounced manner). One of Stefan and Jamile’s friends works at the White House, and he came out to meet us and congratulate us. He even brought with him White House coins for each of us, which was a wonderful and unique gift. It served as our medal for the day, as the RAUSA belt buckles would not arrive until later in the summer. After hanging out for a bit, we walked to a delicious burrito restaurant for some lunch. From there, we headed back to the truck. Jamile had parked at a military base (since Stefan works at the Pentagon) next to Arlington National Cemetery. Stefan and I decided it would be a good idea to run the few miles from the restaurant to Arlington National Cemetery since we clearly hadn’t run enough yet. My legs were definitely much stiffer than they had been, in part because it was almost chilly outside with the rain, but I warmed up as we went on, and it did get us there that much faster. As you may recall, day one was in the books and we had yet to utter anything to the effect of “what did we get ourselves into” so we were in good shape! We managed to find a delicious Japanese restaurant and sushi bar for dinner on the evening of day one, and we went to bed well fed and ready to tackle the next day. We began the second day where we left off on the first day, with our official chalk line on the road to mark our “start”. As you recall, we finished up the day before in a nicely shaded park, so we began in that same wooded area. The brief bit of shade was nice, and the temps hadn’t yet climbed all that high, but the humidity was already out in full force so we knew we were going to be in for another steamy day. 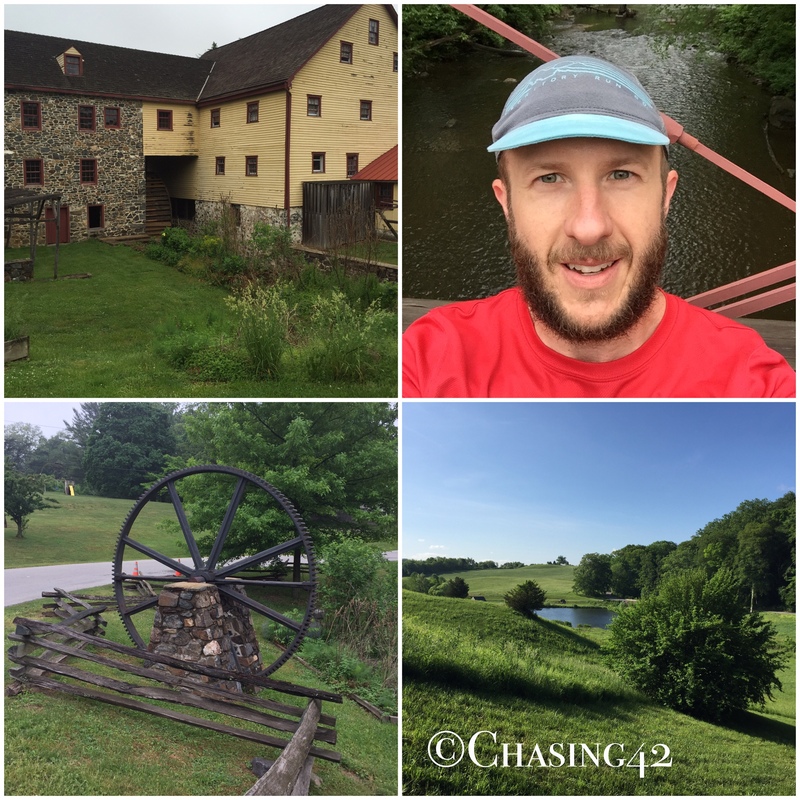 The day’s route took us through Fredericksburg, across the Rappahannock River, and back out along lightly traveled country roads, ending just north of a small town called Tacketts Mill. As luck would have it, Stefan and I began day two running with another amazing member of the core team of runners. Rob Young actually began running a marathon a day or more prior to the start of the Race Across the USA, and was running this event as part of a set of larger goals. He was attempting to set a world record for the most marathons run in a year, and was doing it all to raise money and awareness for vulnerable children. He would go on to win the overall Race Across the USA, and ultimately run 370 marathons in the span of 365 days. On this particular day, Stefan and I had a nice leisurely chat with him about his running experiences, his background in various other sports, including professional cycling, and his plans to break future world records as well. It was clear within 5 minutes just how passionate he is for the sport and the level of commitment and dedication he has to what he is doing, and it was amazing to be a part of that with him. We stuck with him for 5 or 6 miles before we once again realized we were going faster than planned, and we made the decision to pull back and slow our pace. It would appear that we learned our lesson, as it didn’t take us 18 miles to slow down this time around! For the most part, the rest of the day involved a nice pleasant run through the country in semi-rural Virginia. Once again, the temps rose and our sweat levels increased, but Jamile was right there to offer us the additional ice and water that we needed to keep moving forward and enjoying the opportunity to be out there running a second marathon in as many days. There was no shortage of hills, and we ended the day with over 2,700 feet of elevation gain and a hair over a marathon in distance. Overall, it was a great day and we even managed to splurge on slurpees when we were done, which obviously made it all worth it! Our legs were feeling really good after the past two days. We had been rolling them out pretty consistently, and even doing a bit of icing to be on the safe side. That, combined with some good refueling, left us in good shape for the longest of the four days. The day’s route, and the second to the last day of the entire event, was set at a bit over 33 miles. There’s probably a joke in there somewhere considering the timing of this distance, but everyone was tired enough when we started and even more tired when we finished that we no doubt missed it. The theme for the entire day was heat and hills, and there were copious amounts of both as the miles ticked by and the sun got higher in the sky. However, the first 18 miles or so flew by pretty quickly and we were both rather surprised at how smoothly the morning had been going, and how well our legs were still holding up. We were moving at a good clip, enjoying the views, and even stopping to take pictures along the way. This was probably the first time that I felt like I could simply keep going indefinitely, and it was a pretty amazing feeling. I’ve indicated before that I’d love to attempt my own trans-continental run at some point in the future, and it was encouraging to get just a small glimmer of the possibility while tackling this experience. We were now getting closer to the outskirts of D.C. so we were in more populated areas, and were able to take refuge on some sidewalks along busier roads, which was nice. We managed to find some of the biggest hills we had yet to encounter. It had also been more than a day since we had gotten off course, so we were due for a bit of creative route adjustment, and we found it near some road construction. We knew the construction was coming and thought we had the directions correct but we made the mistake of stopping to ask a construction worker, who sent us in the completely wrong direction, and we tacked on about a mile before we found our way back to the course. For some reason, this extra distance, combined with the heat and no doubt a bit of dehydration, hit me really hard and I hit a very hard wall. We only had 5 or 6 miles left, but I was hating life. Luckily, Stefan offered me a flavor of honey stinger gel that I hadn’t had before. For whatever reason, the new flavor rejuvenated me and I was back on track for the remainder of the day. We finished the day by cresting the biggest hill we had yet to find, and the sight of everyone up at the top waiting for us was a welcome relief after 34 miles! Once we finished for the day, we actually headed back to Alexandria and Stefan & Jamile’s house, where we would stay the final night since we were so close. 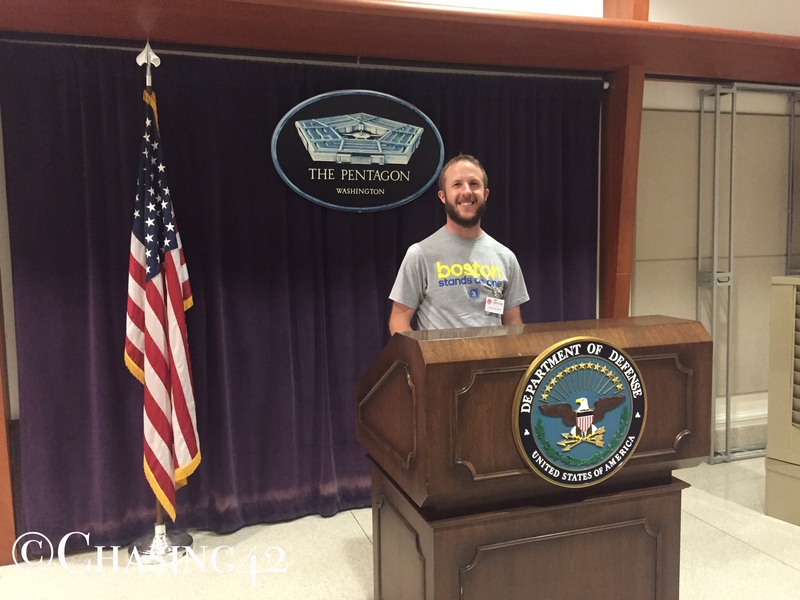 We got cleaned up and then hopped in the car to head over to the Pentagon for a tour. As it happens, Stefan works for the National Guard, at the Pentagon, so I had the privilege of receiving a personal tour of this icon fixture of American politics and military influence around the world. It was fascinating to learn more about the history behind the building’s construction, as well as the overall layout and the various offices and personnel housed within those 5 walls. Seeing the 9/11 Memorial was particularly sobering, and an important reminder of how all of the pieces of life fit together. After the tour, we headed to another D.C. neighborhood to join the rest of the RAUSA team for a celebratory dinner in honor of the final official race the following day. It was an opportunity to get to know folks a bit better and enjoy a nice meal and fuel up for the final run to D.C. and along the National Mall. It was hard to believe that we had already conquered three days and were now gearing up for our final marathon and we were equal parts excited and tired. Luckily, there was rain and cooler temperatures in the forecast for the last day, so we were excited to end on a more comfortable note. I hopped in the car and headed out east the Monday after an amazing Market to Market weekend, with 1700 miles separating myself and the critters from the epicurean. I managed to tackle the trip in two days of “quality” time in the car, and we arrived at our new home on the afternoon of May 12th. Mind you, this was a home that we purchased despite my not seeing it in person, as I was unable to travel out with the epicurean to house shop. Luckily, I trust her completely, and she found us a wonderful new home! There was a flurry of unpacking and organizing over the next week (don’t worry…it’s still happening, but more to come on that in a later post), but I managed to stick to my training schedule pretty well and do some initial exploring of the area. I figured out pretty quickly that I wasn’t in the flat lands of Iowa anymore, and the combination of hills and humidity meant I was in for a period of adjustment. So, despite only having been in our new home for a couple of weeks, I decided to register for a significant running challenge in a part of the country I had spent very little time. That’s what everyone does, right? In all fairness, I had actually registered for this series of races before we made the decision to move, and the move just made the opportunity that much easier to take advantage of and enjoy. Late last year, I read about a group of runners who were planning on embarking on a trans-continental run from Los Angeles to Washington, D.C., beginning in January. I was immediately intrigued, and my interest grew substantially when I found out that the race would be happening in conjunction with a research project to study the long-term impact of running on endurance athletes. The combination of running and research was right up my ally and I quickly explored how I could possibly get involved. 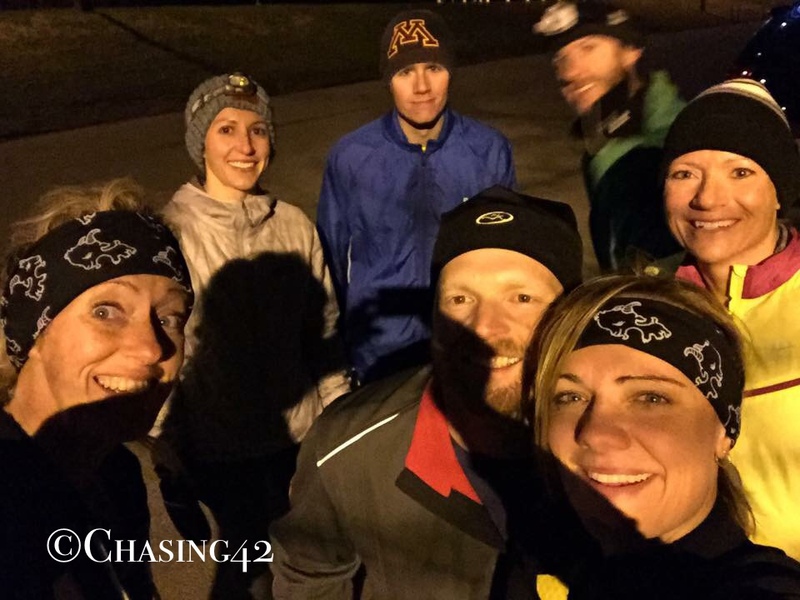 In addition to the initial group of 11 core team members, the group was providing the opportunity for runners to join them throughout the country, either for an entire state, a 4-day experience, or a single day. The route involved running roughly a marathon every day consistently, with various rest days as the team crossed into a new state. 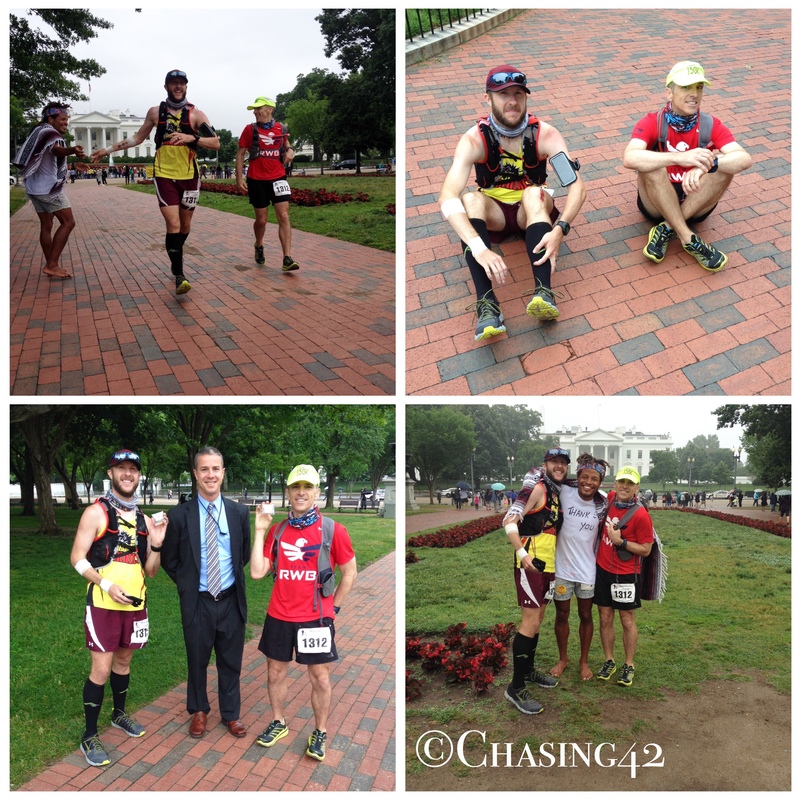 In total, it meant that the core team members would be running for 140 days and would cover 3,080 miles in total. 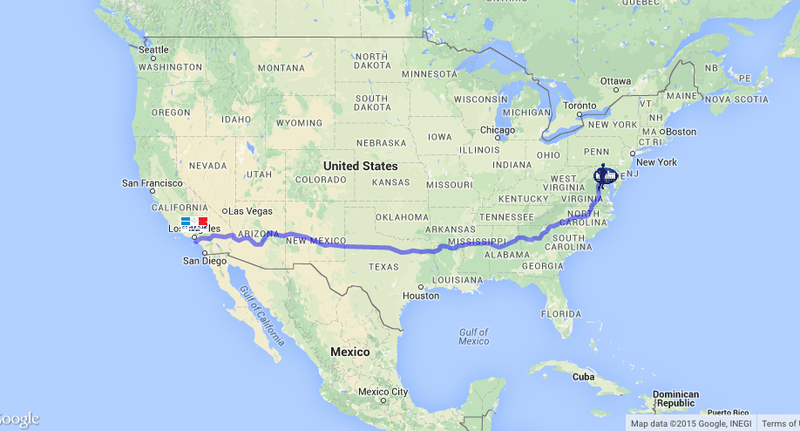 The thought of some day completing my own run across the U.S. has been on my mind for some time, but I’m clearly not at the point in my life where that is a possibility. The team took a southern route, so driving from Iowa wasn’t really an option, and flying didn’t seem necessarily financially responsible when lodging and transportation to each of the starting points was factored in. However, the last 4 days of the race involved running across Virginia and finishing on the White House lawn (or across from it, technically). Luckily, we happen to have two very good friends who live in the D.C. area who also happen to love running, and it didn’t take much work to convince Stefan and Jamile to join me on this adventure. What’s more, they graciously agreed to pick me up at the airport and organize our transportation. Stefan and I would tackle 4 straight marathons, and Jamile would join us as an amazing support crew, and we’d spend the rest of the time relaxing throughout Virginia when we weren’t running. It was wonderful to see two familiar faces after arriving in Delaware, and I was excited to visit with them and share the adventure! One of the most exciting aspects of moving to the east coast for me is the increased access to public transportation. When I lived in NYC, I loved not having to drive anyone and still have access to everything the area had to offer. Thus, I was excited to hop on a train Friday morning for the 90-minute ride to D.C. Stefan and Jamile picked me up at Union Station, and we headed back to their house in Alexandria to get packed up. Our plan was to stay at a hotel in Fredericksburg, VA for the first three nights, and then drive back to stay at their house the final night. This would position us well for fairly easy drives in the morning out to the starting lines. Since the route itself was mainly along public roads, with some trails tossed in when available, the start and finish lines were simply easy access points in the road once the required distance had been met. We made it out to the hotel, got checked in, and then went and did a bit of exploring in town. Although I lived in Virginia for several years, I had never visited the town and it was fun to walk around (with coffee in hand, of course). 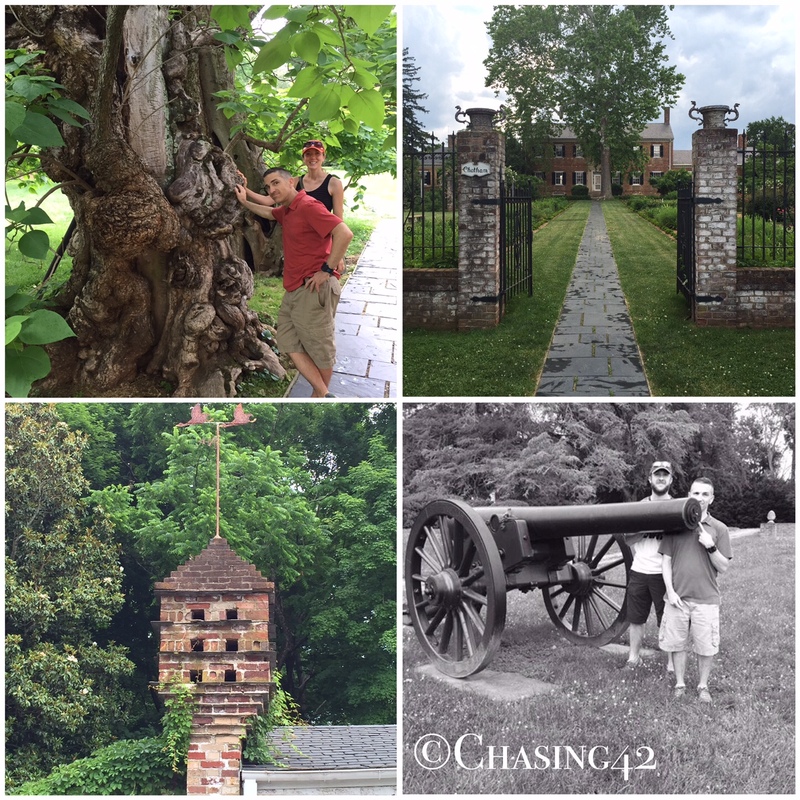 I had forgotten how much I loved all of the history on the east coast, and this part of Virginia is filled with it, so we had plenty to see, while also taking it easy before our first marathon in the morning. We woke up extra early on Saturday morning for the first race since we were uncertain of how things would play out and we wanted to make sure we weren’t late. The “start” was an intersection out in the country where the group had finished the previous day, so we had GPS directions and found our way out there without any issues, and arrived around 6:30 for the 7:00AM start. We met with the race organizers and received our bibs, shirts, and buffs, and hung out and waited for others to arrive. There were 7 remaining core team runners that had been at it since the beginning, and we had a chance to meet everyone briefly. 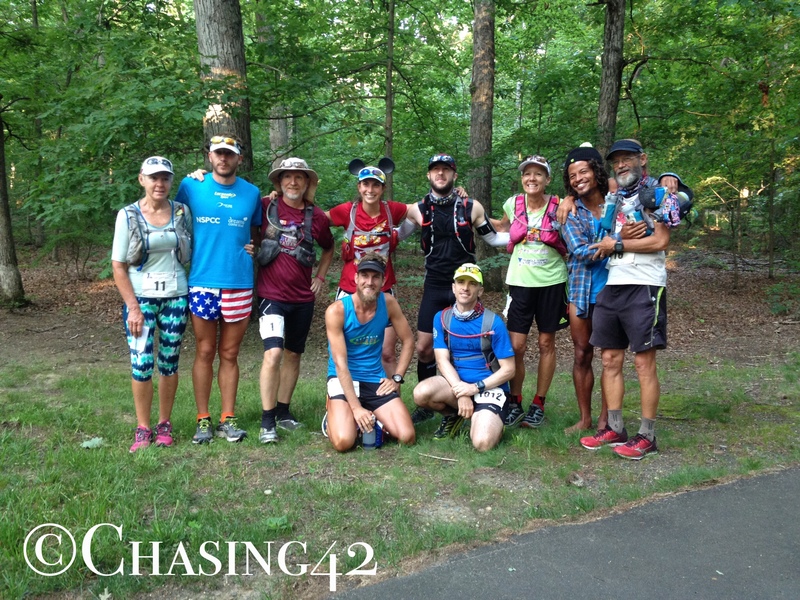 There were several other folks that were joining us for the remaining 4 days, and 1 other runner was half way through the full 9-day Virginia leg. I was feeling comfortable, well-rested, and excited to get things rolling. I’ve run plenty of long distances and marathons, but this was my first attempt at a Quadzilla (4 back-to-back marathons) and there were still some nerves turning over in my stomach, but I knew I had trained well for it and my body was ready to handle the stress. 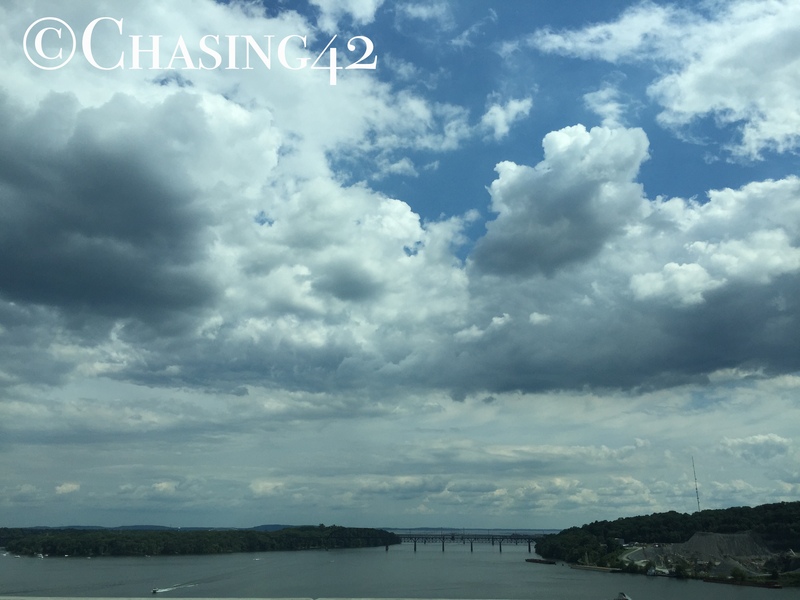 We could already tell the weather would be a bit more of a challenge, with warm temperatures and high humidity, but the plan was to take it slow and enjoy ourselves. 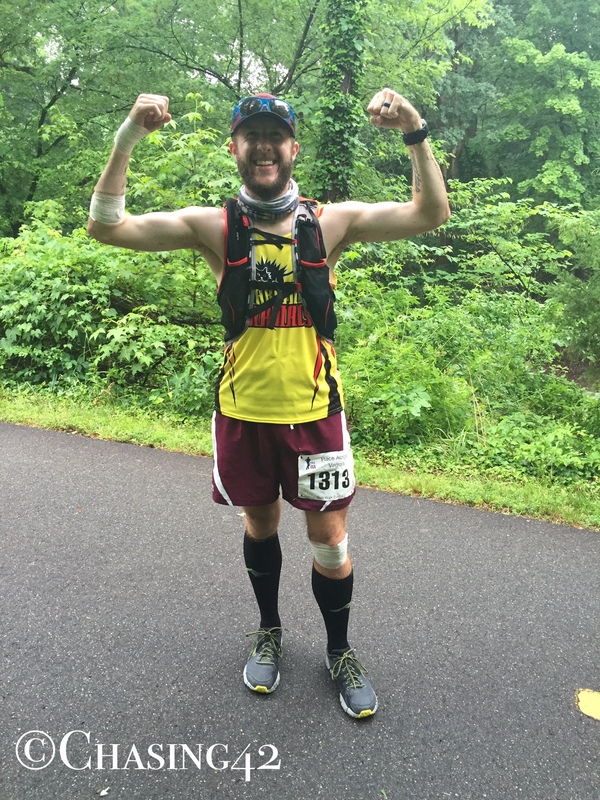 I was treating this set of races like other ultras and slowing my pace while continuing to push forward. We began promptly at 7AM and our small group of runners was off, heading down a lonely country road. It was the first of many peaceful country roads we would traverse over the next 4 days. I decided to play it safe and I opted for my Salmon S-Lab 12 pack so I could carry plenty of water, as well as nutrition and other emergency medical supplies. There were aid stations every 6 miles or so, but I knew the heat would lead me to want more than a handheld bottle could carry. This proved to be a smart decision and I was grateful for the extra hydration. This was actually the first time I had worn the pack, as it was a replacement for my S-Lab 5, which I was able to get replaced for free after the zippers rusted shut. I very quickly realized that the minimal added weight was unnoticeable and the extra storage capacity made this an even better pack! Stefan and I took off at a relatively controlled pace and initially tried to stay around 9:00 min/mile. This seemed reasonable at the time, but I had neglected to factor in the hilly terrain, much like that which I had recently discovered at home. We ended up falling in with one of the core runners, and had a wonderful conversation with him over many miles. We were able to hear some of his stories from the previous few months of constant running, as well as learn more about the research project he was working on in conjunction with the event. 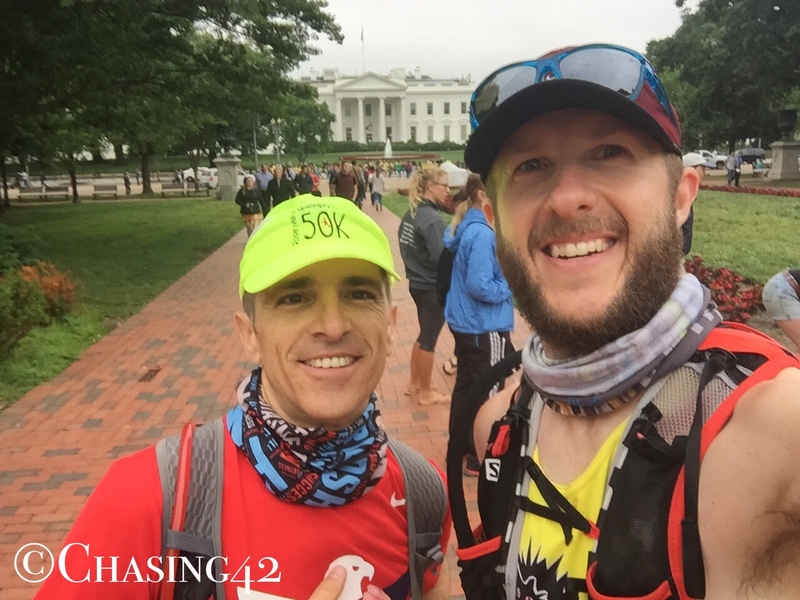 The miles just seemed to tick by as we chatted about running research, physiology, and academia in general, along with learning more about his experiences during the event. 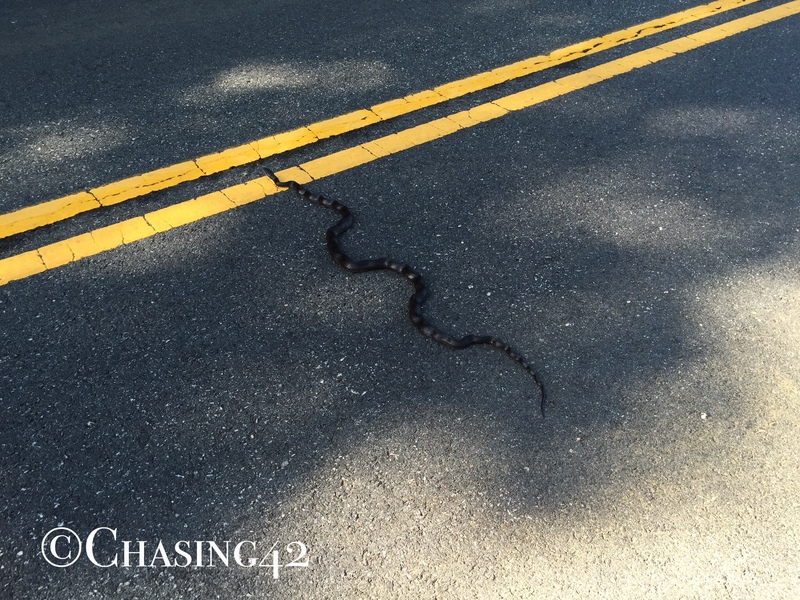 It wasn’t until we were startled by a rather large snake in the middle of the road that we realized we had missed a turn a few miles back and gone off course. Since it was a small event and the roads weren’t closed, the course wasn’t marked so we were required to follow the directions we had been given to stick to the course. This wouldn’t normally be a problem, but it does mean looking at the directions instead of leaving them in your pocket. We stopped for a photo-op with the snake, and then turned around, while also calling one of the support team members, who was nice enough to come pick us up and bring us back to the course turn we missed. We ended up adding about 3 miles to our already long day, which would come back to bite us later on. Snakes…why does it always have to be snakes? 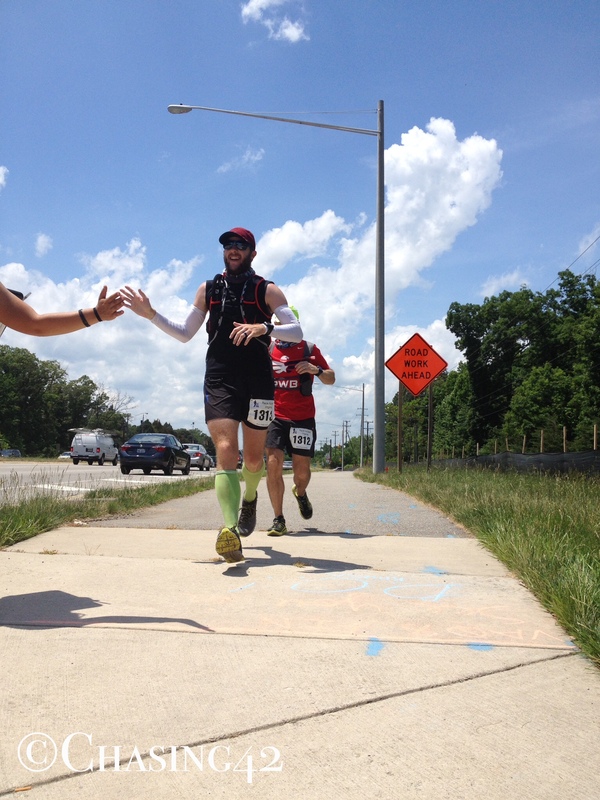 Around mile 18, the heat and hills were beginning to get to us and we realized it wouldn’t be smart to try and maintain the pace we were hitting so we bid adieu to our new friend as he continued on. I was amazed that after almost 3,000 miles, he was still able to tackle the road so effortlessly, and that proved to be the case for each of the core runners. Our respect was instant, and our amazement continuous! 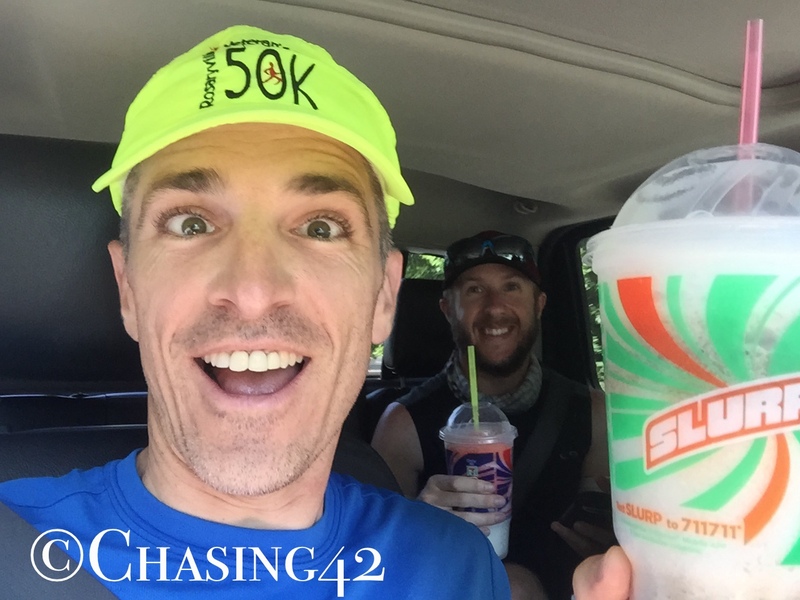 We slowed our pace a bit, and the heat began to get to Stefan a bit so we made sure we were hydrating well, along with taking advantage of ice at the aid stations and Jamile’s wonderful personal aid stations along the way. We decided it was in our best interest to take it easy the final 10 miles, so we enjoyed being outside (despite the intense sun!) and took in our surroundings. 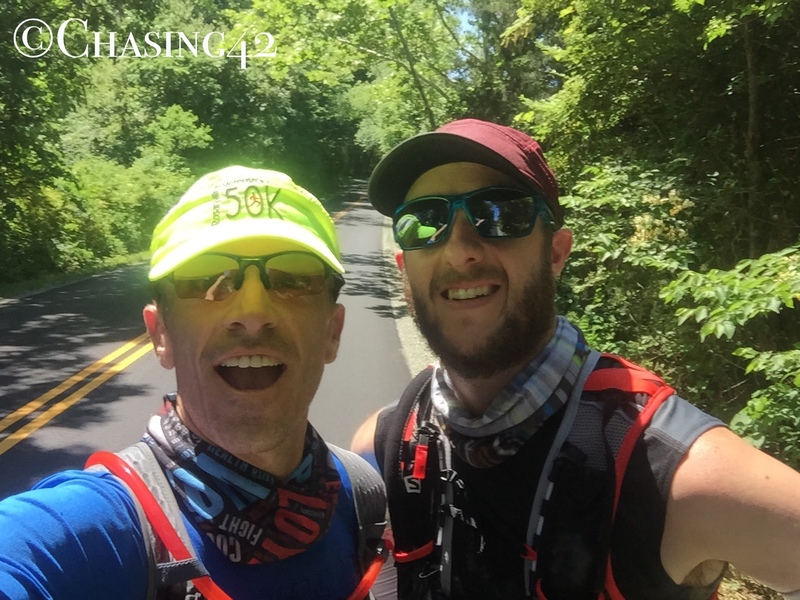 Near the end of the route, we were sent along a beautiful wooded trail towards a state park for the finish, and the change of scenery and surface provided some much-needed relief from the heat and gave us a chance to enjoy the experience even more. We were by ourselves for this final stretch, aside from Jamile’s timely roadside assistance and the reality that we would be doing it all over again for the following three days began to really sink in. We entered the park and were able to see the “finish line” up in the distance, and the support folks and a few other runners lingering and waiting for everyone to come in for the day. There was no ribbon or formal finish line, no inflatable arch, and no medals at the end, but it didn’t matter. Our sense of accomplishment was all the reward we needed and we were all smiles as we crossed the finish line. What should have been close to marathon distance became almost 30 miles after our detour and we couldn’t have been more happy to reach the end! We lingered about for a bit chatting with folks and were able to cheer on a few other runners who weren’t too far behind us. Then we hopped back in the truck and headed back to the hotel to shower and rest a bit. I’ll never get used to just how refreshing and rejuvenating a hot shower can be after a long distance run, and I was feeling much better. The sun had taken its toll, but my legs still felt fresh, and I was sure this was a good sign for the days to come. The rest of the day was spent eating, relaxing, and hanging out. I was reminded yet again that although I love to run because it gives me a chance to push myself and test my abilities, it is ultimately more about the people I’m with, and I couldn’t have been happier to be sharing this experience with two amazing friends. We were all looking forward to the next three days and the laundry list of memories that were just over the horizon! 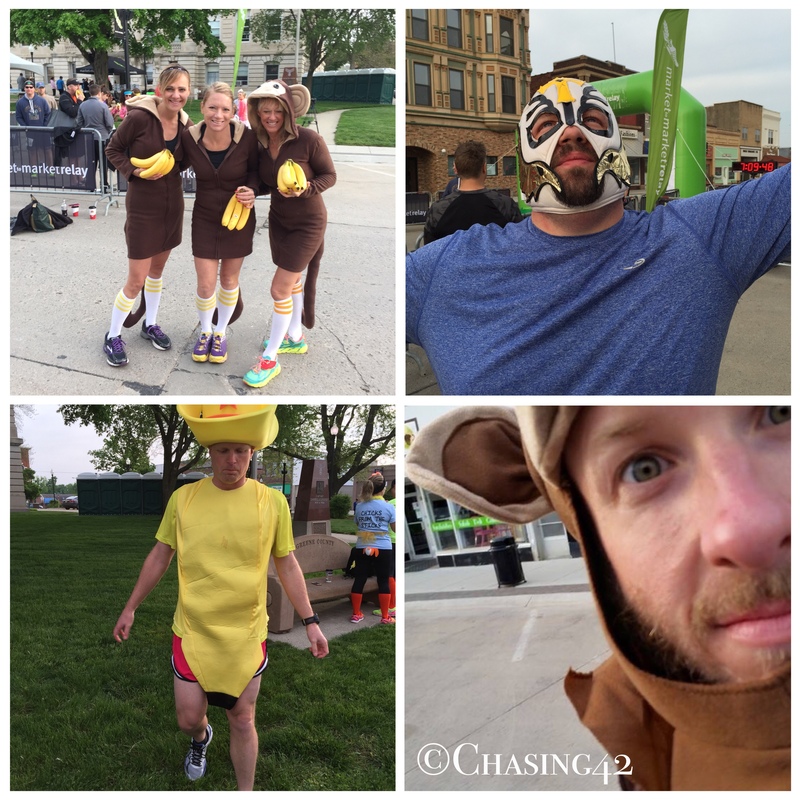 Market to Market 2015: The Speedy Streakers Strike Again! It’s still hard to believe that my 10 years in Ames was at an end. Quite a bit has changed in my life over the course of those 10 years, not the least of which is my passion for running and the friends that I have picked up as a result. Thus, it was only fitting that my last weekend in Iowa was spent with an amazing group of friends doing what we love to do…run! 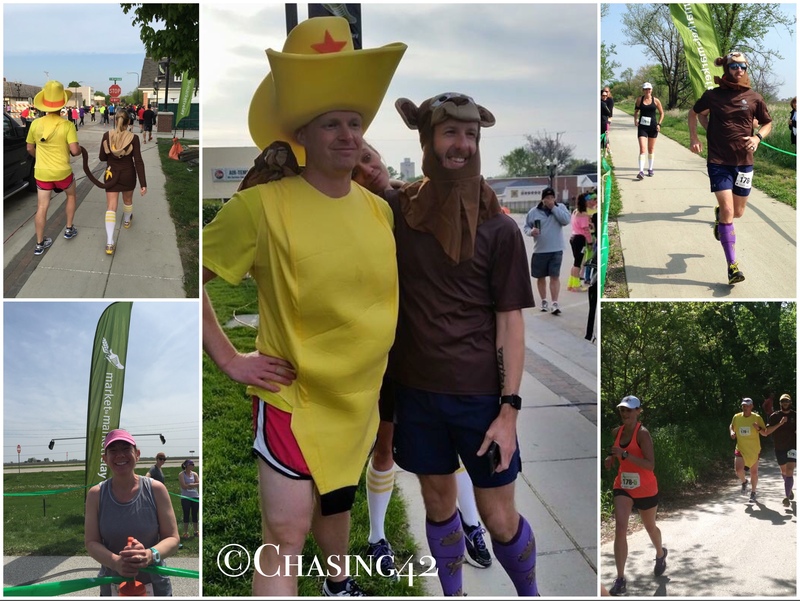 This was the third year in a row that we’ve participated in the Market to Market Iowa Relay, and our Speedy Streakers team has the relay and the preparations down to a science at this point, which made for an amazing weekend. This race was my farewell of sorts as well, so there was plenty of chatter leading up to the race, and I was looking forward to a fantastic weekend of running and shenanigans! Our goal, as a team, has always been to have as much fun as possible, with a little running thrown in, and we certainly hit the mark this year! We always find a theme so we can prepare costumes accordingly, and we landed on “Barrel Full of Monkeys” this year, although “What Does the Fox Say?” was a close second. The opportunity to dress up in a monkey costume was just too good to pass up, obviously! We awoke bright and early on Saturday morning (May 8) after a short but restful burst of sleep and donned our costumes before heading down to the starting line a few minutes away. We met up with some of the other Vardo teams and cheered folks as their waves took off. 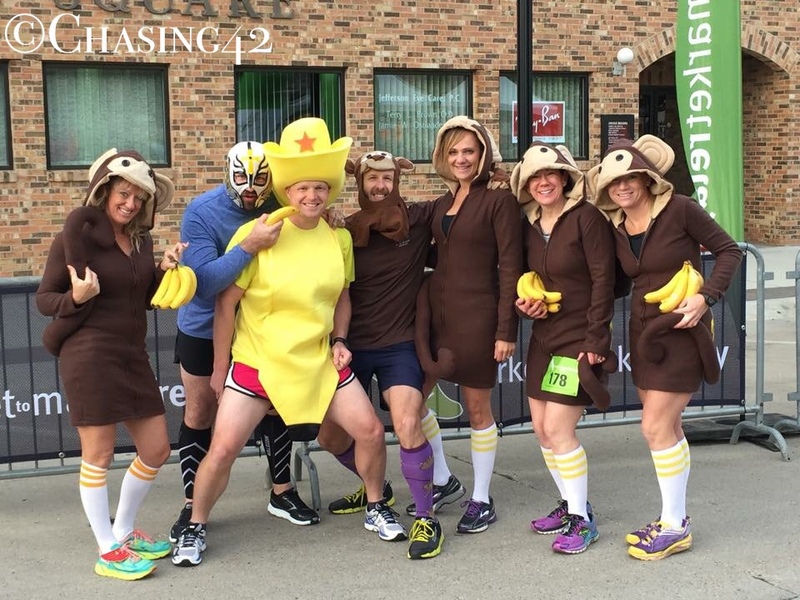 It was quite convenient that M2M was giving away bananas- we took advantage and grabbed plenty to hand them out to other runners. What else is a monkey to do? Would you care for a banana? From the beginning, our relay experience was about equal parts running and delicious Jello-O shots, and we made the most of the day. In previous years, I’ve added on additional miles by running various legs with other teammates, and I crafted a repeat performance again this year. However, everyone was in a nostalgic mood and wanted to make the most of the day, so we had multiple runners for 14 of the 17 legs of the race, and we easily tallied the most collective miles of any team out on the course! We treated each exchange point during the relay as a mini-party and did our best to embrace the crazy of the day. The legs all blended together a bit for me, and the weather was relatively cooperative (not too hot, and some wind off and on), so it made for a beautiful day to be outside running. My legs felt great for most of the day, and I did my best to scale back my pace a bit this year. In past years, I’ve logged some significant miles, but forgot I was going long and also proceeded to run the entire day at more of a 5K than marathon pace. I was determined not to be quite as tired this year, and I succeeded for the most part. My legs were still plenty tired by the final collective leg, which several of us ran together and then met the rest of the team to run in the final 1/4 mile to the finish, but overall I felt great. I ended up collecting a bit over 33 miles for the day, which suited me just fine! We crossed the finish line, collected our pint glasses, and were all smiles after another successful relay! We were committed to having as much fun as possible during the after-party this year so we decided to rent a hotel room in downtown Des Moines, not far from the finish, which meant no driving needed. We stopped by our hotel room to shower and then headed back to the after party to meet up with all of the other Vardos. I was able to see a lot of folks and inevitably, the line of “goodbye” moments began. It was wonderful to see so many people but talk about an emotional rollercoaster! Good grief, I love this group! The rest of the evening was a blur of toasts, cheers, antics, late-night pizza, and some memories that I will hold dear for the rest of my life. Throughout the day and night, I did my best to forget that I was leaving on Monday morning and just enjoy the time. What actually happened was a mixture of bittersweet moments with some of the best friends anyone could ask for…I went out with a bang doing what I love with folks I love, and I wouldn’t have had it any other way. Hi there! Did you miss me? Remember when I shared just how chaotic the month of March was for the Epicurean and I? Well, April hasn’t been much better! Regardless, my apologies for the gap in my posts. On the bright side, I have a lot of wonderful stories to share, as this has been a busy month in my running life, as well as my life overall. You can expect some “catch-up” posts over the next few weeks as I share some of the exciting races, classes, and experiences that have enriched my running life this month. 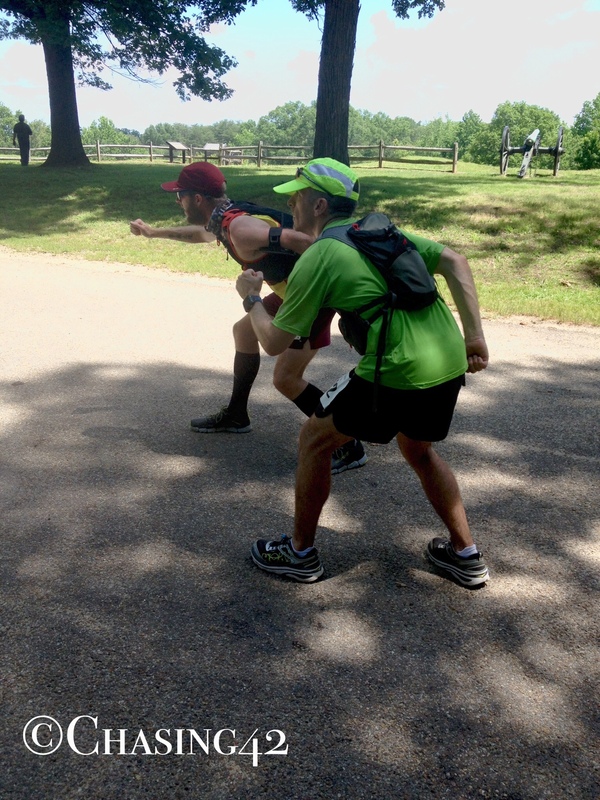 Training for longer endurance races involves a lot of planning, logistics, and miles. It also means training your body to run through the night and fight off the fatigue that comes from simply running at 3AM when you should be sleeping. 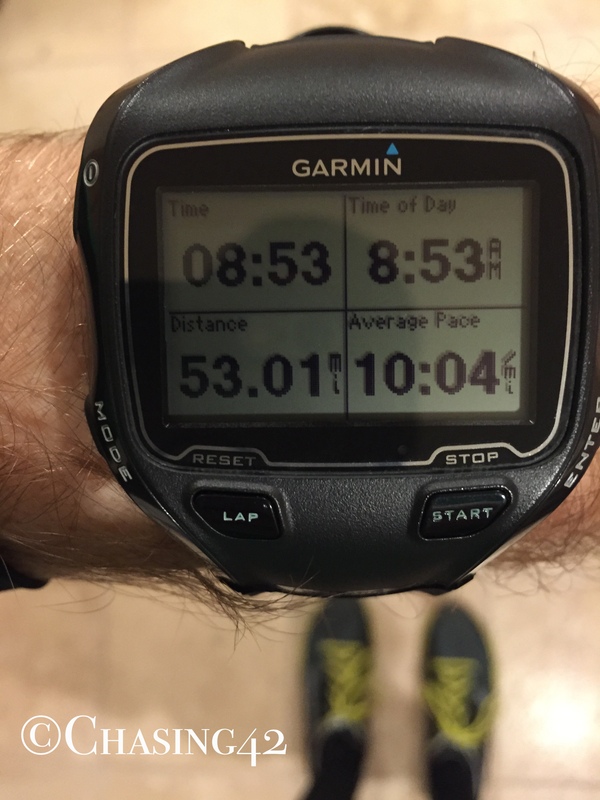 Over the past few years, I’ve planned several overnight runs for the purpose of training my body to acclimate to those evening miles, as well as pace myself for the 50- and 100 mile distances. Luckily, I have an amazing group of friends and they have always been more than willing to come out and join me for some of those miles, and keep me company in the dead of the night. I’ve been trying to squeeze in as many “one more time” experiences as I can in my final weeks in Iowa, and I wanted to fit in one more overnight run as well. So, on the evening of Friday, April 3rd, I scheduled yet another run. I used the same 5-mile route that worked so well last time, allowing for one loop each hour so folks knew they could join in on the hour no matter what. I headed out to the party early, arriving at 9PM, and ran the route once by myself to make sure there were no problems with the course. It was a bit chillier than I would have liked (33 degrees) but the 30 mph winds from earlier had thankfully died down considerably. I probably went out a bit fast, which I seem to do quite regularly, but I was at least consciously trying to slow down. That counts for something, right? The run was scheduled to start at 10PM, and I had a surprisingly large number of folks come out to join me, which was AMAZING. The friends I’ve made and the conversations I have on runs have always been my motivation and source of energy, and I could feel all of that this time as well. The “event” has gotten to the point where it’s a part of our local running culture and people know what you mean when you mention it, which I think is really cool. After 4 laps (20 miles), my legs still felt really good, which I took as a good sign of things to come. On the 5th lap, we made an important detour to Insomnia Cookies for a late night snack. Now, normally I would recognize that a giant chocolate and peanut butter cup cookie might not be the best nutritional choice in the middle of an ultra, but the craving was real, the energy was high, and I had plenty of friends to support and partake in my bad judgment! 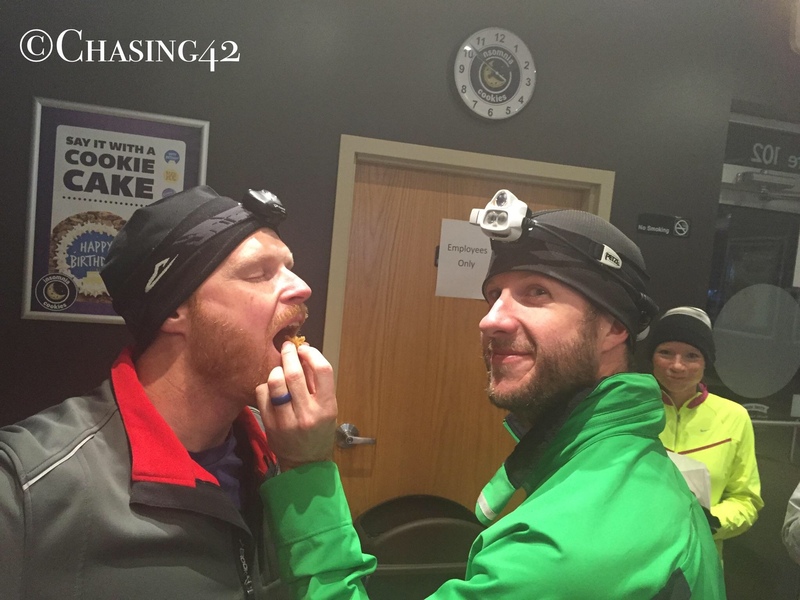 Insomnia Cookies- sound nutritional advice for any ultra! Luckily, the sugar bomb remained a dud in my stomach and I was able to tick off the next 2 or 3 laps with minimal additional discomfort. By 3AM, the crowd had thinned out considerably, but I still had an intrepid soul with me. I was 30 miles in and feelings pretty darn good. The normal late night nausea that usually hits me was a bit more mild than usual, and my legs were tired, but not sore. We picked up another runner at 4AM (well, traded one for the other), and kept on moving. By 5AM, I could once again feel the excitement of an impending dawn, and I perked up a bit. Daylight also meant more runners showing up for our regular Saturday morning run (which the route masters were kind enough to start at the same park). The large group showing up again at 7AM was all the extra energy I needed to make a final push and knock out the remaining loops. 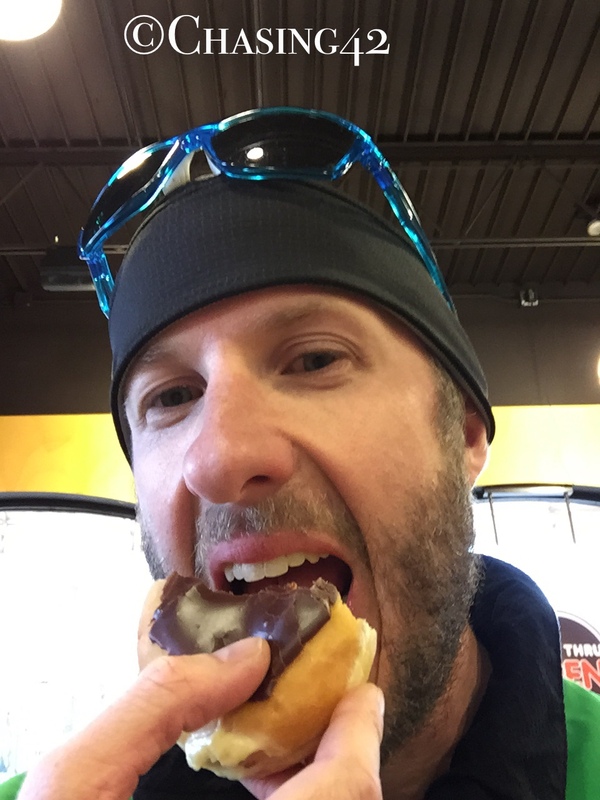 The final loop may or may not have involved a much needed detour to Dunkin Donuts for a Boston Creme. They should probably sponsor me as a runner. Just sayin’. I’ll let the evidence speak for itself 🙂 I finished with 53 miles, and decided to stop around 8:30AM. As usual, I was wide awake again, although I knew that wouldn’t last much past my much anticipated hot shower. Despite some questionable nutritional choices, I had fueled really well, and stayed hydrated despite the cool temperatures. Both were facts I was quite happy about. You’re asking yourself why you’ve never stopped for a donut yourself, aren’t you? It’s ok. You can change that! Once again, this was a fantastic experience due to the friends that came out to run! As I drove home, I was a bit sad and wistful at the realization that this was indeed the last time I’d be able to have the event here. Don’t worry, though, the 4th Bi-Annual Vardo Slumber Party is being planned virtually, and I’m going to be all over Facetime. I might get a few different looks running alone in Delaware at 3AM and talking on the phone, but that will just add to the allure of the experience!